What inspires you and gives you that fire in your soul that makes you excited to wake up every morning? What would you be willing to risk to make that kind of passion your full-time gig? For me it’s throwing dance parties. As a woman who LOVES dancing, eating healthy, throwing parties and spending time with other women, I feel like they are one of the things I was called to do. I love every aspect of planning these parties and hope that my events are a safe, healthy environment for women. And no matter how hard I have to work or how many events I have to throw to build my brand and business, I won’t stop. Besides, where else can you go dancing (without getting creeped-up on), eat amazing food, dress up in Bee costumes, have over the top experiences, crowd surf and party like no one is watching? You know what they say: If you do what you love and it will never feel like work. Every day I feel grateful that I am surrounded the most supportive husband, friends, amazing sponsors and the world’s BEST party guests to help make this dream of mine a reality. The inspiration for the Queen Bee Dance Party originally came from my participation in the Mrs. Utah United States pageant. It has been so fun to surround myself with other ambitious women who are doing good things in the community through their pageantry platforms. But whether or not you wear a crown, I believe every woman is a queen (like the OG Queen Bee: Beyonce) and each of us has the power to create and do amazing things. Before I get into all of the party details and fun, I need to give a MASSIVE shout out to one of my favorite people at my dance parties is my DJ, DJ HardCorey. He literally is the only reason it’s a “Dance Party’ and he goes all out with his outfits (remember his pajama onesie from the Pajama Glam Dance Party?) and I LOVE his sweet record spinning skills and silly personality. Thank you Corey, for making it fun and always catering to our dancing demands. What is a good party without some sweet photo spots to make it extra special? Of course, the Guys from the Selfie Scene were there taking care of all of the ladies with their photo booth. This is one of the most innovative photo booths I’ve ever seen, where you stand behind a green screen and take your photos with multiple unique backgrounds and all within one session in the booth. The other photo booths included this gorgeous couch from Planet Beach Spa, seriously swoon worthy. And this cute wooden honeycomb backdrop was made by my talented hubby, Nick. Just look at these gorgeous ladies! 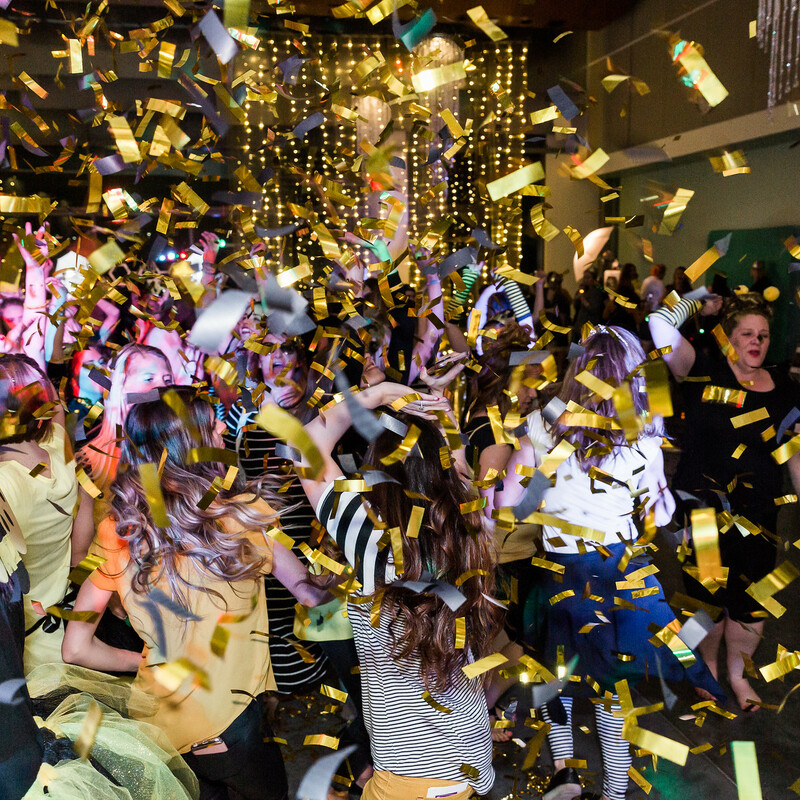 We all know that a good party is only as good as the food, and the food and beverage sponsors of the Queen Bee Dance party killed it! I wanted to give a BIG thank you to the wonderful team from Blue Lemon who spoiled all of the ladies with delicious salads, wraps, fruit, veggies and hummus. They went above and beyond and the guests haven’t stopped gushing about what a great job they did! Make sure to check them out and find a location here. The team from San Diablo Churros served baby churros that were filled with honey (of course) and they were just a delight. They had a line at their darling cart pretty much the whole night long! Make sure to check them out and use them at your next event! Edible Arrangements also shared some of their fresh fruit bouquets and they were fresh and delicious! The guys from Keto OS served their amazing ketone beverages and took such great care of all of the Queen Bees. So many ladies mentioned hearing about Keto OS but were so excited to try it. I have been using it to prep for the Mrs. Utah pageant and have been able to trim up quite a bit. Learn more about the Pruvit products here. Just Organic Juice was also there keeping us refreshed with their organic and refreshing juice blends. They are a local company that makes the freshest juice perfect for dexoting, cleansing or just drinking as needed. Make sure to follow and learn more about them here. Thank you so much for your love and support ladies! I hope you’ll join me at my next dance party coming up on June 24th, 2017! From the bottom of my heart, I’m so grateful to each of the sponsors who give so much to make these dance parties an unforgettable experience. This event was hosted at the Viridian Library in West Jordan, Utah.